Explore Greater Lansing-This app from the Greater Lansing Michigan Convention and Visitors Bureau and works as a nice on-the-road tool to supplement Greater Lansing's printed visitors' guides and other online resources. Clicking on Greater Lansing Guide from the app's main page takes users to a list of categories like Where to Stay, What to Eat and Things to Do to find more detailed information about offerings around the area surrounding Michigan's capital city and Michigan State University. Click on the "+" at the bottom of a page for an individual attraction or business to find maps, phone numbers, links to Web sites, business hours, photos and other helpful information. The app's Calendar of Events arranges listings by categories like Family-Friendly Events, Michigan State University Sports, Fairs/Festivals and Music. You can also call up events by date by clicking on the calendar at the bottom of each event category page. I found that using the Search tab from the main page worked well. For example, my search for "Old Town" gave me a number of links to businesses and events in the Old Town area. Be sure to check out the "Offers" section for discounts, primarily for food and admissions to Lansing attractions like the Michigan Historical Museum, the Impression 5 Science Center and the R.E. Olds Transportation Museum. The latest update for the app was January 2014. 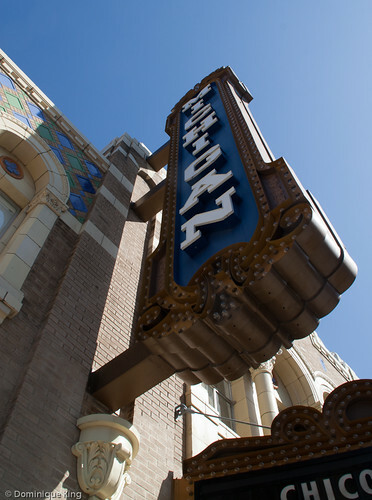 Visit Ann Arbor-This app from the Ann Arbor Area Convention and Visitors Bureau catalogs the offerings in this college town (University of Michigan) about an hour west of Detroit. We're frequent visitors to A2, so it was fun to explore this app and see many places that I do know, as well as a few new (to me) discoveries that we'll need to explore during future visits. The app is an abbreviated version of the CVB's main site with lists of dining, accommodations, events and other attractions. To search by category for events, go to Categories from the Events tab, leave the choices you want to see checked and uncheck the rest of the choices, and enter a date to see what's happening on that day. This process was a little clunky, but it worked well enough for checking things on the go. The "augmented sight" feature promises to help you identify landmarks in town by pointing your phone at the site. Since I'm sitting here in suburban Detroit at the moment, I wasn't able to test-drive this feature, but it looks like something fun to try next time we visit Ann Arbor. The app also has suggested itineraries for a brewery tour and a fairy door tour (fairy doors are a series of miniature doors placed around town, usually at ground level, that often resemble the building's main entrance in miniature. The fairy door itinerary includes a half dozen of the many fairy doors in A2 to get you started on this hidden treasure hunt!). The latest update for the app was December 2013. Pure Michigan Film Office-I downloaded this free app with the idea that I might find some cool locations for future photo opportunities or story ideas. 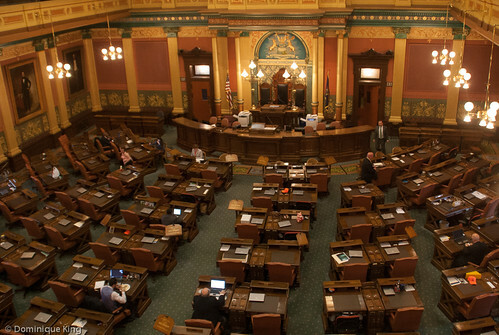 The app allows users to access more than 80,000 images of more than 5.600 locations throughout the state collected in the Michigan Film Office's database. You can search by region, city, landmarks, or type of site. I tried a search for vintage train depots near my home by going to the general category of Trains/Railroads, selecting the subcategory of Train Stations/Depots and checking Southeast as my region choice and came up with seven possibilities within 65 miles of my house that included the Lapeer Train Depot that we visited and photographed last year, plus a few others that looked like real possibilities for a photo or story trip. Each location had a short description of the site, usually a photo or two, addresses and links to Google maps for a map and directions. The same search on the full Web site yields identical results, but you can more precisely pinpoint locations by individual cities or counties or specific mileage from your current location and see larger versions of the same photos you'll see on the app. Filmmakers will also find other resources here like links to available crews and other support services. I can tell I'm going to have fun with this app because it makes it easy to find some of my favorite photo subjects (depots, county courthouses, bridges, lighthouses) when I'm traveling on the road. The last update for this app was October, 2013. The spirit of Mummy Djehutymose still lingers around his empty coffin at the Kelsey Museum of Archeology in Ann Arbor, Michigan...at least that's what he cheerfully tells followers of his Facebook page...and followers of his Twitter feed learned that he experienced a little extra excitement earlier this week as my story about him and his museum went up as a guest post at the Wandering Educators site. Mummy Djehutymose seemed to like the story as he logged onto Twitter and said "You honor me with this great article," and confided to his Twitter followers that "My ba is fluttering with excitement all around my coffin!" @WanderingEds @midwestguest You honor me with this great article. Thank you. My ba is fluttering with excitement all around my coffin! Well, I'm glad he liked the story and shared his appreciation for it online! 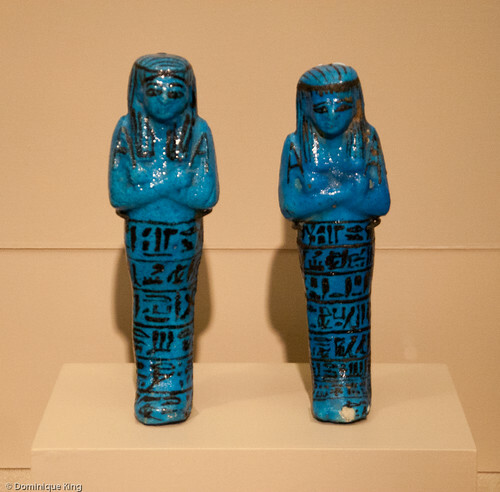 Check out Kelsey Museum of Archeology brings Ancient Egypt into the modern age at Wandering Educators. Wandering Educators is an online travel resource for global educators published by Jessie Voigts and her husband, Ed Forteau. Be sure to check out Jessie's latest guest post at Midwest Guest, Honor and humanity are highlights of visit to the US Air Force Museum in Dayton, Ohio, which appeared here yesterday. Djehutymose, son of Nespakhered and Temple of Horus priest, died somewhere between 684 and 525 B.C., but his spirit still holds court on Facebook these days. The Mummy Djehutymose Facebook page is a project of the Kelsey Museum of Archeology at the University of Michigan, which displays Djehutymose’s coffin while his online persona seeks his missing mummy. Djehutymose’s coffin is just one of the museum’s Egyptian treasures that seemed to fascinate visitors young and old when we visited the Kelsey on recent weekday afternoon. There are many interesting vintage buildings along Ann Arbor’s South State Street in the University of Michigan’s main campus area, but I’ve always particularly loved the quirky look of the Kelsey Museum. 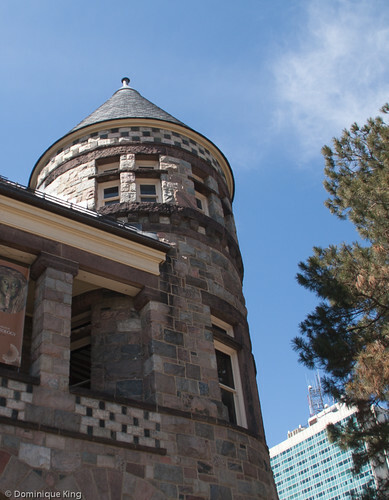 The museum’s building is a late-nineteenth-century house constructed of random-cut fieldstone and adorned with a three-story turret capped with a conical roof. The Romanesque-style building, designed as home for one of the earliest student Christian associations in the country bears the name of lumber baron John S. Newberry. Newberry’s widow Helen funded $18,000 of the building’s $40,000 construction costs in 1888-1891, and the building still bears the Newberry name on its façade. 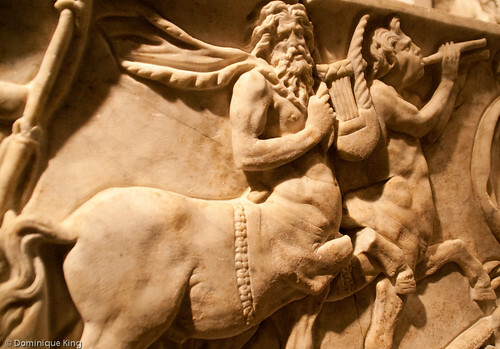 Meanwhile, Francis W. Kelsey, a long-time professor of Latin Language and Literature at the University of Michigan, had been amassing an impressive collection of Mediterranean and Near Eastern antiquities since the 1890s. Professor Kelsey believed that participating in pioneering archeological digs and viewing the collection’s treasures were among the best ways for students to learn about ancient culture, but his passion for collecting meant the University needed more space to house it. By 1921, the University rented Newberry Hall for classroom space and, by the end of the 1920s, began moving the archeological collection into the building. The University bought Newberry Hall in 1937. Kelsey’s collection became the foundation of the archeological museum that U of M eventually named for him in 1953. The collection and offerings like educational programs for children and adults, research, and support of fieldwork continued to grow over the years. In 2009, Edwin and Mary Meader donated $8 million to the University to fund a 20,000-square-foot addition to the museum to the back of the original Newberry Hall, providing a climate-controlled environment for display area, research and storage. The University named the new wing for Mary Meader’s grandfather, the noted western Michigan pharmacist William E. Upjohn. The new addition means the museum now publically displays 1,300 to 2,000 artifacts, many more than the 200 to 300 items on display in just the original building. That is still just a fraction of the nearly 100,000 artifacts in the museum’s collections. The museum plans to display several hundred additional items in open storage cabinets on the first floor, and one family consisting of mom and several young explorers there when we visited found that several of the drawers were already stocked with small artifacts for viewing. 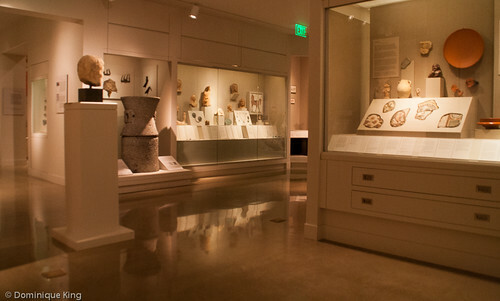 The collection focuses on Greek, Egyptian, Near Eastern and Roman artifacts with individual display cases and areas highlighting distinct cultures, along with displays that show the interconnections between ancient people and cultures. I found the large variety of artifacts illustrating the daily lives of people among the most interesting things on display. Items like jewelry, pottery, toys, lamps, coins, tools, jugs and more gave me a real feeling for how people lived during ancient times. The museum has many funerary objects like mummies and items left as offerings in tombs (like a mummified cat!) that also gave me a look at the way those same people viewed death as well. 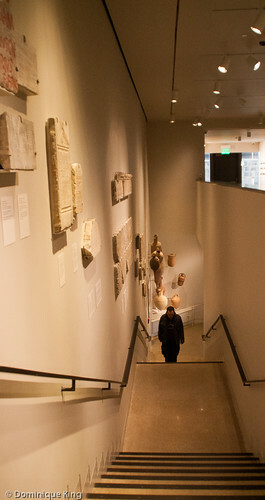 The second floor of the Upjohn wing focuses on Roman life and displays a nearly life-size watercolor replica of wall frescos from the Villa of Mysteries in Pompeii. Museum hours are 9 a.m. until 4 p.m. Tuesday through Friday and 1 p.m. until 4 p.m. Saturday and Sunday. The museum closes on Mondays and for University of Michigan holidays. 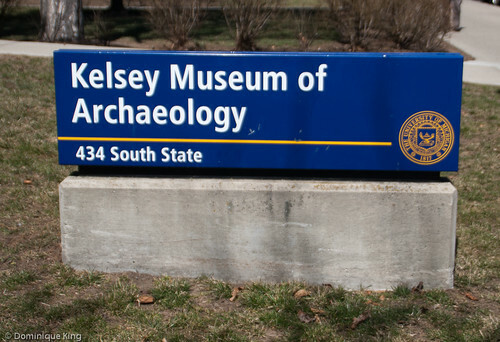 Can’t get to the Kelsey Archeological Museum in person? The museum has a strong online presence. Check out an online gallery of cuneiform tablets with texts predating 2000 B.C., diaries of ongoing archeological digs, and the museum’s Tumbler account, which features news and articles about curators’ favorite artifacts online. You can, of course, visit Djehutymose’s Facebook and Twitter feed, as well as the Kelsey Museum’s active Twitter feed and Facebook page. Everything has to start somewhere, and if you visit the Michigan Union building (a student center at Ann Arbor's University of Michigan) you can literally stand on the spot where President John F. Kennedy first urged to students to make a difference in the world by volunteering to live and work in developing countries. That mention during a Kennedy campaign speech on October 14, 1960 may have been the first public mention of the idea that eventually became the Peace Corps, but it was his brother-in-law Sargent Shriver who went on to really develop the program and agency. 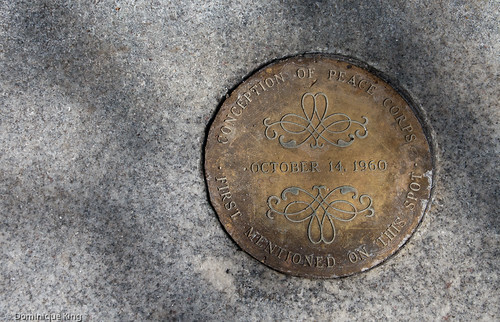 I found this medallion on one of the front steps of the Michigan Union, underfoot as students hurried by on the way to or from class on a busy weekday. I love finding little links between states as we travel across the Midwest, so it was fun to find this historic metal truss bridge, originating in Ohio, at a metropark near Ann Arbor, Michigan. We often visit a string of metroparks spread along the Huron River in Washtenaw County, and it's always fun to check out the rapids at Delhi to see if the kayakers are running them. So, it was disappointing when they closed the bridge offering the easiest access to the park in 2005 and watch as area residents rallied and posted signs imploring authorities to save the span. Thankfully, efforts to save and rehabilitate this pretty little bridge prevailed, and the span reopened to traffic in 2008. Today, what many consider as one of Michigan's most scenic spots carries a designation as a local historic district (the only bridge in Michigan with this designation) and carries park traffic, plus traffic to the historic village of Delphi Mills about 6 miles upstream from Ann Arbor. Saw mill owner Jacob Doremus platted the settlement in 1836, just before Michigan became a state. The thriving village had two flour mills, a woolen mill, a saw mill and a plaster mill during the mid- to late-1800s. 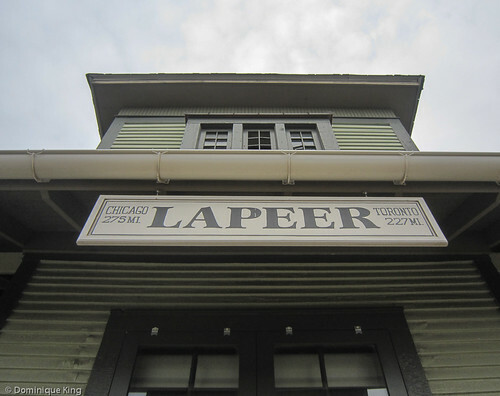 Delhi also had a railroad depot, cooper shops, a lumberyard, a stockyard and a grocery store during this era. A wooden bridge built at the site in 1851 meant residents no longer had to ford the river in horse-drawn vehicles. The mill next to the wooden bridge closed and the Wrought Iron Company of Canton, Ohio, contracted with the county to replace that bridge, as well as five other bridges along the Huron River, in the late 1800s. 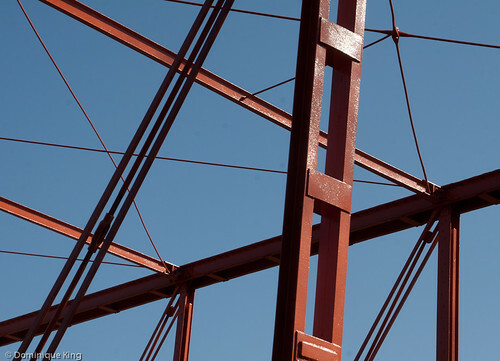 The company specialized in fabrication of iron truss bridges, mass producing parts to build their bridge designs and mostly selling them through catalogs and brochures. The company fabricated each bridge to a specific site, so no two were exactly alike, but selling the bridges in parts and shipping them to the rail depot closest to their destination meant local contractors could quickly and economically assemble the spans. 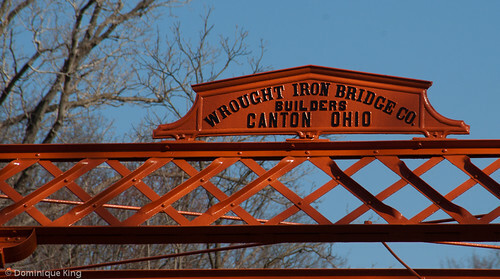 The Wrought Iron Bridge Company became one of the country's leading bridge manufacturers, erecting nearly 4,300 spans in 26 states, as well as Canada and Mexico, and employing over 270 people by 1882. 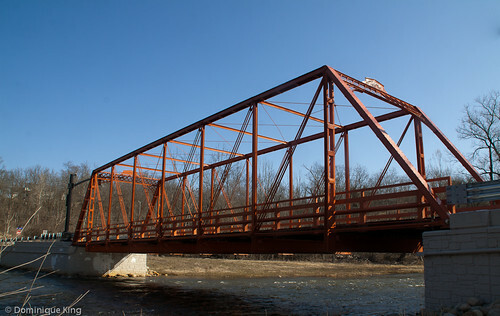 The eight-panel Pratt truss bridge built at Delhi in 1888-1890 is one of only a few drive-through wrought iron bridges still in use in Michigan. A tornado swept through Delhi Mills on June 6, 1917. The twister cut a half-mile-wide and 25-foot-long path through the area, lifting the bridge off of its abutments and throwing it into the river. The county responded by establishing its first chapter of the American Red Cross to help with relief work as many became homeless with nearly every home in the village destroyed or heavily damaged. 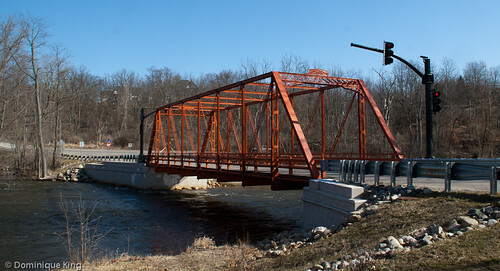 The county rebuilt the bridge in 1918, most likely from parts salvaged from the destroyed span, according to an historic inspection in the early 2000s. In 1929, the Washtenaw County Road Commission established the area as parkland. In 1940, Henry Ford purchased most of the property at and around the bridge with the idea of building a water-powered facility at the Delhi Rapids, while allowing the Road Commission to continue using the property they developed as parkland. Ford failed to develop the property as a mill, and the Huron-Clinton Metropark Authority purchased it around the time of Ford's 1947 death. The one-lane bridge became a local landmark, but by the early 2000s, there were plans to replace it with a new two-lane bridge. Bridge supporters worried about losing an important part of the area's history and the adverse impact a new bridge would have on the ecology of the river, the popular river rapids, and the park's beauty. After the Citizens for the East Delhi Bridge Conservancy successfully turned back plans to destroy the bridge, the span closed for a three-year rehabilitation. Today, the 109-foot-long bridge is the major pathway to the Delhi park and an access road for the Village of Delhi Mills, which still has nearly 50 houses and a population of about 123. 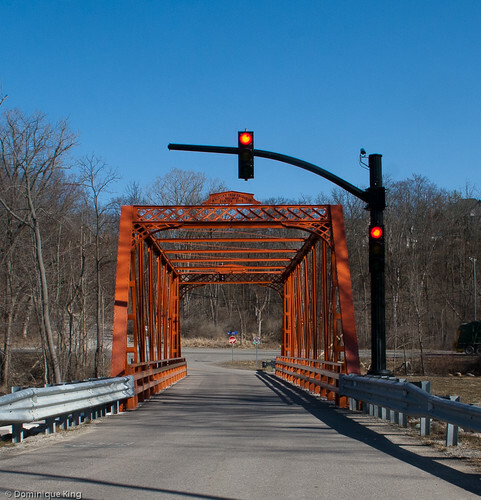 Interested in the history of some of Michigan's other historic truss bridges? Check out Historic Highway Bridges of Michigan by Charles K. Hyde. I developed a habit of taking what I envisioned as "title slides" long ago and often used the photos as literal title slides in slide shows or as section headers in photo albums. I also used my pictures of building signs, directional signs, historic markers, museum placards and other printed material as a quick way of taking notes when taking photographs. Here are a couple of nice building signs I spotted during a recent trip to the college town of Ann Arbor, Michigan, home to the University of Michigan. 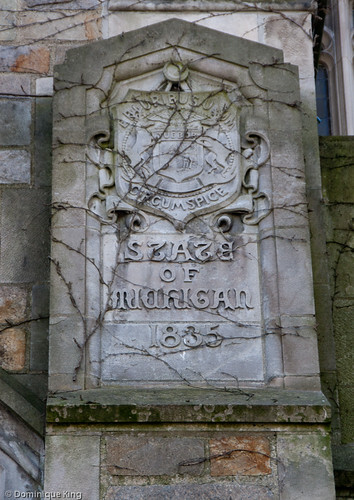 The "Michigan" sign is at a downtown movie theater near campus, and the "State of Michigan" carving is on a beautiful old building on the U of M campus. I never really liked most pimento cheeses I sampled from the grocery stores, but I'm hooked on the pimento laced concoction with a zesty cayenne kick from Zingerman's Roadhouse in Ann Arbor, Michigan. We long knew of Zingerman's Deli near downtown Ann Arbor and often ordered cheese, bread, or other gourmet goodies from their mail order operation for Christmas, but when the company opened its Roadhouse restaurant in a unassuming strip mall nearly 10 years ago, we couldn't wait to make the hour-long drive out to its location on Ann Arbor's west side. Zingerman's original deli opened in 1982 and earned fans like Mario Batali and Oprah Winfrey, who once had the deli deliver 400 hand-pulled beef brisket sandwiches to a studio audience at a filming of her talk show in Chicago, and awards like "best deli in America" from Zagat's and "the coolest small company in America" from Inc. Magazine. 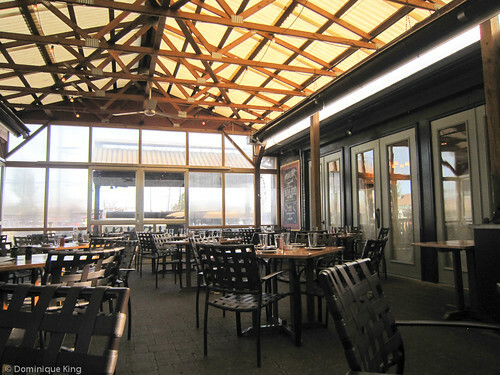 The Roadhouse clearly had a lot to live up to when it opened in 2003, but it quickly earned fame as being named one of the nation's top 10 Barbecue Restaurants by Bon Appétit and, of special interest to cheese lovers, the gooey goodness of its mac'n'cheese wowed Food Network's Alton Brown, who named it as one of America's Top Ten Comfort Foods. 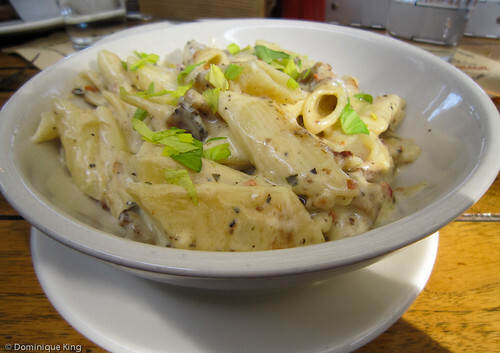 The regular Roadhouse menu includes several versions of mac‘n’cheese, including; macaroni with pimento cheese and peppered bacon; macaroni and three-peppercorn goat cheese; macaroni with smoked chicken and Monterey Jack; and classic Roadhouse Macaroni & Cheese made with 2-year-old raw-milk Vermont cheddar. I usually opt for the classic macaroni & cheese, but on my most recent visit, I decided to live large and order the pimento cheese and bacon version. I'm not usually a big bacon fan, but this version is one I'll definitely order again. The Roadhouse menu is always full of tempting choices, especially if you like comfort food with a bit of a Southern flair. 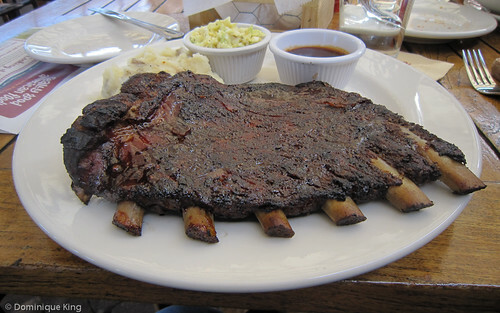 Grits, catfish, buttermilk-fried chicken and all things BBQ will sometimes tempt me to have something other than mac'n'cheese, especially if we're dining in the restaurant's outdoor patio and can smell the BBQ pit-smoker going. This isn’t the place for picky eaters, strict vegetarians or vegans, or a budget dinner, but we always find stopping well worth it. During one visit, we chatted with our waiter about the various BBQ choices on the menu. He mentioned that pulled goat was one of the specials that day and that the goat, like a lot of the items on the menu, was from a regional source (in this case, a farm in Ohio). Now, Tim and I both like pulled pork, but weren't too sure about the idea of ordering an entire entree of pulled goat. Our waiter urged us to try it and quickly returned with a generous appetizer-sized sample for us to try. We ordered one pulled pork dinner and one pulled goat dinner, intending to share both dishes. Our server arranged to plate both of our dinners to include a half-portion of each meat, without an extra charge for the sample or special plating. That experience was but one example of the emphasis Zingerman’s places on personal attention and customer service. I’d heard that one of the owners, Ari Weinzweig, regularly visits the restaurant and talks to customers. Sure enough, we spotted him at the Roadhouse another afternoon—circulating around the outdoor patio, refilling water glasses, taking drink orders, bussing tables and chatting with customers. We like going to the Roadhouse for a late lunch/early dinner as we start home from a day in Ann Arbor. We always have plenty to eat and usually have enough to take home for lunch the next day. We've often ordered pimento cheese to go after a Roadhouse meal, and I was particularly pleased when I discovered I could order a full pound of it to go from the Roadhouse during our most recent visit--getting about twice as much for the same price that I would pay if I picked it up at Detroit's Eastern Market or one of the few gourmet grocery stores, like Plum Market, in the Detroit area that carry it. 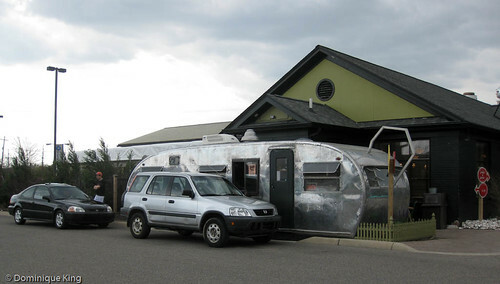 You can also pick up things like bread and pastries to go from a retro trailer with a drive-through or walk-up window parked in front of the restaurant. And be sure to check out the cool neon sign out front, crafted from antique glass tubes made by Detroit's Eureka Neon Company in 1953. I can't believe how quickly the holidays are approaching! Here, just in time for some last minute shopping, are some suggestions for those special people on your gift list from some of my past stories about Midwest businesses. I love wind chimes, and The Wind Chime Shop is a must-see whenever I visit southern Ohio's Hocking Hills area. The selection of chimes is astounding, and I always end up with at least a few sets as gifts and for myself when I stop in the store. Check out the store's Web site, and look for my favorite Gentle Spirits chimes! Love cheese? Then you'll love Cheese Haven near Port Clinton, Ohio. We like stopping by on our way home from Cleveland, or when we drive on out to the Marblehead lighthouse and picking up some of the store's cheddar cheese spread (check out No. 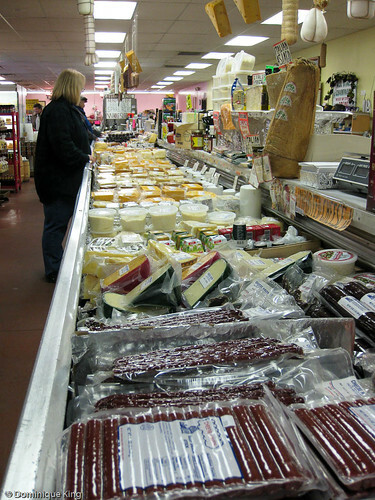 6 on Cheese Shop list at the Web site). I'm ready to place my order for cherry goodies from Cherry Republic! The company in Glen Arbor, Michigan, offers dried cherries, cherry jellies and jams, cherry salsa, cherry barbecue sauces, chocolate covered cherries, gummy cherry Sour Patch candies (my favorite), and almost any other product that incorporates one of Michigan's signature crops. 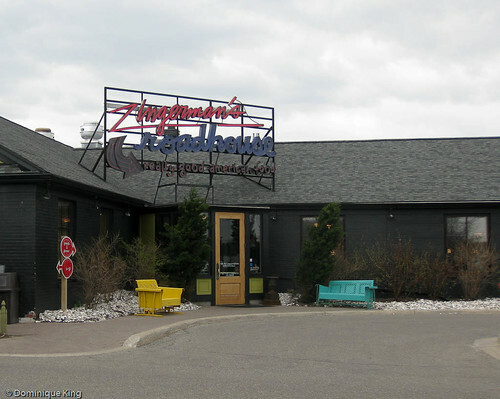 Zingerman's family of businesses is another Michigan foodie delight-a family of companies dedicated to sharing the best in regional fare and fun food finds at their Ann Arbor deli, Roadhouse restaurant, through local outlets like Detroit's Eastern Market, and their mail order catalog. Our favorites include pimento cheese and their dense, rich coffeecakes (the coffeecakes freeze well if you can't eat them all at once). You can order a canoe from the Piragis Boundary Waters Catalog (we did), but you can also order a lot of other gifts from this Ely, Minnesota, outfitter. You can find plenty of outdoor gear, as well as gifts like jewelry, posters, photographic prints, and other hand-crafted items from northwoods artisans. For some curious reason, my story about our visit to Sechler's Factory Pickle Store in Fremont, Indiana, is one of my most popular posts. 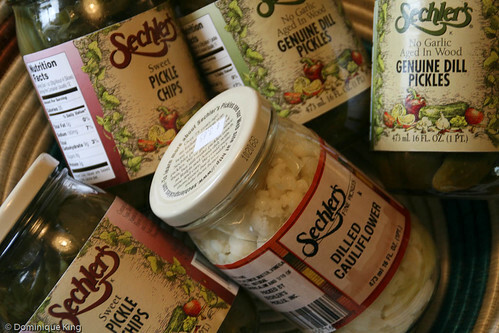 We occasionally find Sechler's Pickles in grocery stores in the Detroit area, but you can view a bigger variety of pickled products and gift packs at the Sechler's Web site. You'll have to call or fax in your order, but you can pick up a free pickle recipe book in PDF format before you log off to place your order. Looking for a funny gift and can't make it all the way up to Ishpeming, Michigan? Check out Da Yoopers' online store for beer...um...accessories, Upper Peninsula souvenirs, John Wayne lunchboxes, Elvis shopping bags, and the full catalog of Da Yoopers music and DVDs. Check the Rock Knockers section of the site to shop for the rock hound on your list. Visiting Bronner's near Frankenmuth, Michigan, is definitely worth the experience, but if you're short on time and still need that one special ornament for your tree or as a gift, you can always check out the huge Christmas store's online catalog. There are a few of our favorite places for gifts from the Midwest. Do you know of others I should check out? Good Eats: In a pickle at Packo’s-Visit Tony Packo’s Hungarian hot dog joint in Toledo, Ohio. Yes, this is the Packo’s immortalized on the M*A*S*H television show by Corp. Max Klinger, the character played by real-life Toledo native (and Packo’s fan) Jamie Farr. Road Trip: Catch a baseball game-Minor league baseball can be a fun and economical alternative to big league baseball, so why not consider taking in an out-of-town game during vacation or a quick road trip? Check out these Michigan and Ohio teams! Let Exposure.Detroit show you around the city-Great Detroit-themed photo show at the Bean & Leaf in downtown Royal Oak featuring the work of talented local photographers (including The Wandering Photographer, a.k.a. @photowanderer). Culture Clubs spur interest in Detroit’s fine arts-Some great discount ticket programs for fine arts fans in Detroit. Check out symphony, opera, dance, film and other fine arts programming at some really affordable prices. Good Eats: Zingerman’s Roadhouse, regional comfort food goes upscale in Ann Arbor-Zingerman’s emphasis on regional ingredients, imaginative twists on classic comfort food and superior customer service make for a great dining experience. Who wouldn’t love a place with a half-dozen different takes on mac ‘n’ cheese on its menu? The Urbane Life is a community blog for Urbane Apartments, a growing group of apartment buildings, luxury lofts and condos in metropolitan Detroit.